In 2002, I published a report in the journal Radiocarbon. The report presented a hypothesis about radiocarbon dates of some events in the Ancient Near East. Afterwards, there was a Response to my report, published by Manning et al. Several Remarks on the Response are given elsewhere. What follows here is an exposition about one statement in the Response. My report in Radiocarbon begins as follows. Many archaeologists studying the Ancient Near East have claimed (or complained) that radiocarbon dates are earlier than archaeo-historical dates for the early historical period: for Egypt (Görsdorf et al. 1998; Bonani et al. 2001), Sumer (Crawford 1991), Israel-Palestine (Bruins and van der Plicht 2001; Mazar 1992), Italy (Guidi and Whitehouse 1996), and the Aegean (Dickinson 1994), among others. Indeed, in a 2001 issue of Radiocarbon that was devoted to Ancient Near Eastern chronology, the introductory survey paper concluded that the “Collective evidence … clearly indicates … major chronological” disparities between 14C and archaeo-history for the early historical period (Bruins 2001). Also, a 1989 summary review in Radiocarbon noted that the “incompatibility between … radiocarbon dates and the archaeologic/historic dates of Mesopotamia and Egypt” was a major problem (Weinstein 1989). Too-early 14C dates occur from the earliest historical times until the mid second millennium BC. Disparities vary between about one and three centuries, depending on the historical period and location. The 14C dates are from a variety of samples (many short-lived) and have been processed by numerous researchers; although there is scatter, the problem remains prevalent. Note that the earliest reference is 1989. Earlier references that provide support exist in the literature, but my report did not use them, because assays of radiocarbon taken prior to the 1980s are highly suspect, due to poor techniques—and many people have the same criticism for assays taken during the 1980s. The Response by Manning et al. argues against the above quotation. In particular, the Response states this: “Keenan has carefully avoided citing any of the other studies that have found that, in general, Mediterranean region 14C dates usually agree perfectly well with the relatively secure early historic dates (e.g. Bruins et al. 2003; Hassan and Robinson 1987; Weninger 1990, 1997; Betancourt and Lawn 1984)”. The following discusses each of those five references. This article, on the chronology of the Aegean, was published too early to be considered in my report. Moreover, many of the radiocarbon ages that it analyzes were assayed in the 1970s or even the 1960s; as such, they have little reliability. Additionally, the authors consider only 1σ (i.e. 68%-confidence) ranges for calibrated radiocarbon dates, instead of the standard 2σ (i.e. 95%-confidence) ranges; the authors say that they did so because “dates expressed with two-sigma uncertainties have too great a range to be of use for the archaeological chronology considered here”. Even using 1σ, the calibrated ranges are almost all a few centuries in span. Thus a difference of a century between the radiocarbon dates and archaeo-historical chronology would not be discernable. It can also be noted that, in 1987, Betancourt published another article on the chronology of the Aegean. The article concluded that, on the basis of radiocarbon, “All of the Aegean cultures from the beginning of the Late Bronze Age move back about a century”. In summary, Betancourt & Lawn provide no evidence against my report's hypothesis and the later work of Betancourt provides only evidence for the hypothesis. This reference is from 2003, whereas my report was published in 2002: the Response's criticism that my report “carefully avoided citing” a reference that was not existent at the time of my publication is obviously unreasonable. Even if Bruins et al. had been available earlier, however, it has no relevance for my report's hypothesis—because it treats only the 12th century BC and later. It can also be noted that Bruins has published at least two works that strongly support my report's claim. First, there is Bruins : this work is cited in the foregoing block quotation. Second, there is Bruins & van der Plicht : this work is entitled “Radiocarbon challenges archaeo-historical time frameworks in the Near East”; it is also referenced in the foregoing quotation. Yet both works are ignored by the Response. This article was published somewhat early to be considered in my report. Moreover, many of the radiocarbon ages that it analyzes were assayed in the 1970s; as such, they have little reliability. Indeed, Hassan & Robinson state that “Some of the early determinations were not corrected for isotopic fractionation …"; such correction would increase the radiocarbon ages, often by centuries. Furthermore, most of the standard deviations reported by Hassan & Robinson are at least a century (even after combining sample ages); thus, a difference of a century between the radiocarbon dates and archaeo-historical chronology would not be discernable. The authors present only one set of sample ages that has standard deviation much below a century (after combining): that set has a standard deviation of 35 14C years. The samples, however, are from Amarna. As noted elsewhere, Amarna is about 400 km inland from the Mediterranean (across desert terrain) and is dated late in the second millennium BC; so the Amarna dates are not evidence against my report's hypothesis. This work treats radiocarbon dates for the eruption of the volcano Thera, in the Aegean, during the second millennium BC. There have been many tens of articles published on the date of the eruption, as well as two books. The basic dispute has been that archaeo-history dates the eruption to roughly 1500 BC whereas radiocarbon dates the eruption about a century earlier. One of the two books is by Manning ; it is 520 pages long. The other book is a collection of articles [Hardy, 1990], including one by Manning. Manning has also authored or co-authored many other articles on the eruption date. Indeed, it seems fair to say that determining the date has been the focus of Manning's decades-long career. In other words, Manning well knows that radiocarbon and archaeo-history disagree on the eruption date, and the statement of the Response to the contrary is untruthful. As for Weninger , this article is in the collection edited by Hardy. It does indeed present some analysis that purports to show that the radiocarbon dates are consistent with archaeo-historical chronology. Weninger, though, miscopies or misrepresents much data, and his statistical analysis is unfounded. Describing those problems in detail would take substantial space. Herein, I will just note that the conclusion of Weninger is contradicted by essentially everything else in the large body of work that has been done to date the eruption. That body of work now includes the article of Manning et al. , which claims that radiocarbon proves that archaeo-historical dates for the eruption are a century too late. This is Weninger's dissertation. The relevant chapter is actually a reprint of an article that Weninger published in 1986 (reference below); so again it was published somewhat early to be considered in my report. Indeed, many of the radiocarbon assays used by Weninger were made in the 1970s or even the 1960s; thus, they have little reliability. Weninger's primary analysis is for the First Dynasty of Egypt, which is conventionally dated to roughly 3100–2900 BC. Weninger's figure displaying the calibrated radiocarbon ages (at 95% confidence) for the dynasty is shown below. If the unreliability of the 14C assays were taken into account, the ranges would be substantially wider. Additionally, Weninger's method of calibration does not take into account uncertainty in the calibration curve; doing so would also widen the date ranges. The conclusion is clear: the date ranges in Weninger's analysis of the First Dynasty are too wide to provide evidence against the hypothesis of my report. Weninger also provides some brief analysis of other Egyptian dynasties. That analysis considers only the means of the radiocarbon ages, not the standard deviations. It also throws out the 50% of the radiocarbon ages whose means are farthest from the average. Such a method of analysis would not be considered reasonable by anyone familiar with radiocarbon. Betancourt P.P. (1987), “Dating the Aegean Late Bronze Age with radiocarbon”, Archaeometry, 29: 45–49. doi: 10.1111/j.1475-4754.1987.tb00396.x. Betancourt P.P., Lawn B. (1984), “The Cyclades and radiocarbon chronology”, The Prehistoric Cyclades (editors—MacGillivray J.A., Barber R.L.N.) 277–295 (Department of Classical Archaeology, University of Edinburgh). Bonani G., Haas H., Hawass Z., Lehner M., Nakhla S., Nolan J., Wenke R., Wölfli W. (2001), “Radiocarbon dates of Old and Middle Kingdom monuments in Egypt”, Radiocarbon, 43: 1297–1320. Bruins H.J. (2001), “Near East chronology: towards an integrated 14C time foundation”, Radiocarbon, 43: 1147–1154. Bruins H.J., van der Plicht J. (2001), “Radiocarbon challenges archaeo-historical time frameworks in the Near East: the Early Bronze Age of Jericho in relation to Egypt”, Radiocarbon, 43: 1321–1232. Bruins H.J., van der Plicht J., Mazar A. (2003), “14C dates from Tel Rehov”, Science, 300: 315–318. doi: 10.1126/science.1082776. Görsdorf J., Dreyer G., Hartung U. (1998), “New 14C dating of the archaic royal necropolis Umm El-Qaab At Abydos (Egypt)” Radiocarbon, 40: 641–647. Guidi A., Whitehouse R. (1996), “A radiocarbon chronology for the Bronze Age: the Italian situation”, Acta Archaeologica, 67: 271–282. Hardy D.A. [editor] (1990), Thera and the Aegean World III—Volume 3: Chronology (London: Thera Foundation). Hassan F.A., Robinson S.W. 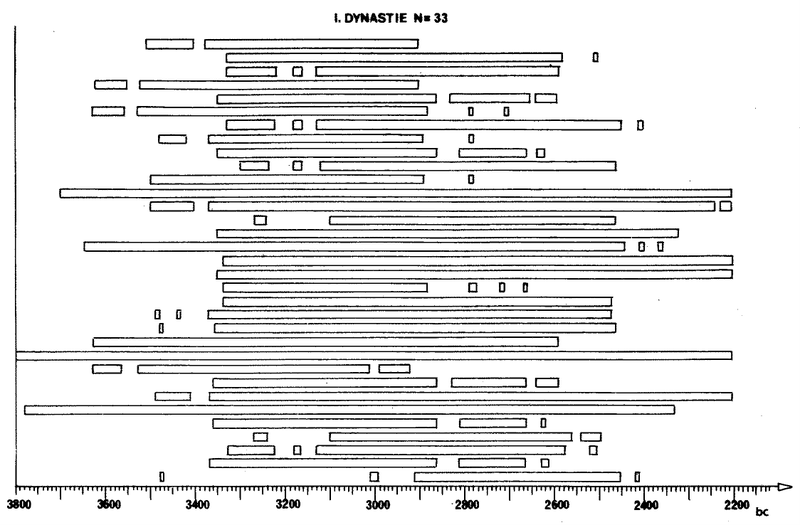 (1987), “High-precision radiocarbon chronometry of ancient Egypt, and comparisons with Nubia, Palestine and Mesopotamia”, Antiquity, 61: 119–135. Keenan D.J. (2002), “Why early-historical radiocarbon dates downwind from the Mediterranean are too early”, Radiocarbon, 44: 225–237. Manning S.W. (1990),“The eruption of Thera: date and implications”, Thera and the Aegean World III (editor—Hardy D.A.) 3: 29–40 (London: Thera Foundation). Manning S.W. (1999), A Test of Time (Oxford: Oxbow). Manning S.W. (2006), “Radiocarbon dating and Egyptian chronology”, Ancient Egyptian Chronology (editors—Hornung E., Krauss R., Warburton D.A.) 327–355 (Leiden: Brill). Weinstein J. (1989), “Book Review: Chronologies in the Near East, edited by Olivier Aurenche, Jacques Evin and Francis Hours”, Radiocarbon, 31: 101–103. Weninger B. (1986), “High-precision calibration of archaeological radiocarbon dates”, Acta Interdisciplinaria Archaeologica, 4: 11–53. Weninger B. (1990),“Theoretical radiocarbon discrepancies”, Thera and the Aegean World III (editor—Hardy D.A.) 3: 216–231 (London: Thera Foundation). Weninger B. (1997), Studien zur Dendrochronologischen Kalibration von Archäologischen 14C-Daten (Bonn: Dr. Rudolf Habelt). www.informath.org/apprise/a4106/b300.htm was last updated on 2009-10-02.